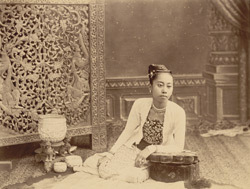 Photograph of a Burmese woman, taken by Watts and Skeen in the 1890s, part of the Curzon Collection: Album of Burmese views presented to Lady Curzon by the Ladies of Moulmein. In this portrait she is dressed in traditional costume worn by wives of court officials. This consisted of a striped silk wrap-around skirt known as a hta-mein, worn with a wide dark waistband and a hip-length jacket of fine muslin or cotton or htain mathein, over a yin-khan, a bodice here with a floral design. In her hair she wears a headband decorated with flowers and she is richly adorned with jewellery. She is posed against a beautifully-carved wooden screen typical of Burmese woodcarving.